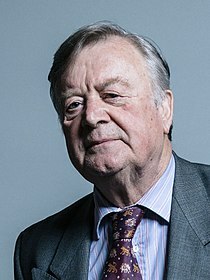 Kenneth Harry 'Ken' Clarke (born 2 July 1940) is a British politician. He was the Justice Secretary in the coalition government. Clarke has had a long career in politics and has served in the cabinets of Margaret Thatcher and John Major. On February 26, 2017, Clarke became Father of the House after the death of Gerald Kaufman. Clarke was born in West Bridgford, Nottinghamshire, England and was educated at the University of Cambridge. He became the Member of Parliament for Rushcliffe at the 1970 general election and became a Queen's Counsel in 1980. He held a number of lower positions in government under Margaret Thatcher until she promoted him to Health Secretary in 1988. He became Education Secretary in 1990 and when Thatcher resigned as Prime Minister and was replaced with John Major he stayed on as Health Secretary until 1992 when he was promoted to Chancellor of the Exchequer. He stayed as Chancellor until 1997 when the Conservatives were defeated in the General Election. John Major resigned as leader of the Conservative Party soon after he was defeated in the general election and Clarke stood for election to replace him as leader and therefore become the Leader of the Opposition. However he was defeated by William Hague in this contest. When Hague himself resigned after losing the 2001 General Election Clarke again stood for leader but was defeated by Iain Duncan Smith. In 2005 he stood for the leadership for a third time but was defeated by David Cameron. It is thought that Clarke was unable to become leader because many in the Conservative Party do not wish to see the United Kingdom replace the pound with the Euro as the main currency whereas Clarke has always been very much in favour of this policy. Clarke returned to the Conservative front bench in 2009 as the Shadow Business Secretary where he has the job of monitoring the performance of the current Business Secretary Peter Mandelson. When the coalition government was formed on 11 May 2010 Clarke was made the Justice Secretary.